Henderson, NV. He was raised in Albert Lea, MN where his father, Bill Ankoviak, finished his career as a professional baseball player. Along with his 5 brothers and sisters, Mike was brought up on a steady diet of baseball, golf, basketball, tennis, football, and mumbley peg. He would spend his evenings scouring the paper for the latest sports box scores. Today Mike's appetite for sports continues. 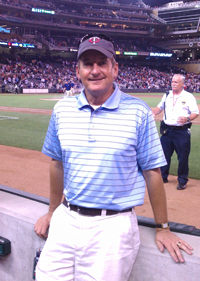 He has been a season ticket holder for most of our pro sports teams in the Twin Cities. He has been a part owner of a race horse stabled at Canterbury Downs, and is an avid golfer and tennis player. You may not agree with all of Mike's opinions but I think you will agree that his insight into the world of sports is always refreshing. MARCH 29, 2019 SPORTS BLOG "HOPE SPRINGS ETERNAL"
Baseball is back, and for the time being, every team is a contender. Spring is the time for endless optimism, hot dogs and cold beer at the ball park (as long as it isn’t snowing) and the Twins are in first place for a day, and remain undefeated! But as my nephew Sam said when I congratulated the Twins on their opening day victory, “that will change”. Actually I’m kind of quietly optimistic about the Twins this year. They have some nice young players and good free agent acquisitions. It could be fun. I’m looking forward to getting out to Target Field when I’m back in town. If nothing else, for the great new food additions that are being rolled out this season. Meanwhile the NHL is winding down, or cranking up as the case may be if your team is in the Playoff hunt. Unfortunately for the Wild, it appears they will be on the outside looking in this year. Unless they pull off a miracle and win 4 out of their last 5 games, while Colorado and Arizona collapse. It could happen, but not likely. As I’ve been saying for a number of years, the Wild have nice players and a good team, but haven’t taken the steps to add the studs in free agency that can get a team to the next level. They visit the Knights in Vegas tonight who they’ve had great success against so we’ll see if that gets them going. Our Knights are a point away from clinching their playoff berth for the second straight year of their existence. I like their chances again to make a strong run at the Cup so it will be super exciting down here in the desert where hockey is king in this town! A new State of Hockey perhaps? Finally, it’s a big weekend of March Madness too. The field is so strong this year, and the Number 1 seeds are so deserving. I will not at all be surprised to see all 4 number 1’s punch their ticket to the Final 4 next weekend at US Bank Stadium in Minneapolis. And it won’t be below Zero with folks lining the skyways looking to keep warm either! Of course I have to pick Duke to win it all, but I’ve watched 4 or 5 teams that appear to be strong enough to get it done. It should be a great weekend finishing off the Sweet Sixteen, and then the Final Four should be outstanding. Duke is my pick, but I’ve got several underdog parlays alive this weekend as we’re always looking for a value in Vegas! On another note, it was fun and gratifying to see the Gophers make the Tourney and get a win under their belt. Here’s hoping they can build on that.